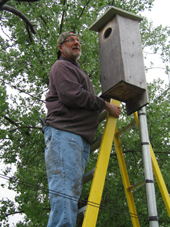 We have placed a small camera with night vision and sound in our 2 nesting boxes hoping to catch some action. We carefully placed some nesting material in the box and focused the camera slightly above it. 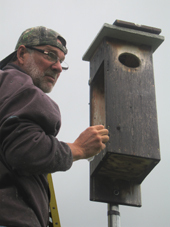 This year (2014) our Male Kestrel (MK) returned on March 30 and proceeded to check out our 2 nesting boxes ( H.M.K.T. box & Kest 2 box). He was joined on April 5 by the Female Kestrel (FK). They both spent time checking out our nest boxes. FK and MK will incubate their eggs for about 30 days. FK will do most of the incubating while MK will hunt and provide food for FK. Once hatched the young will stay in the nest for about 31 days. On May 29/2014 between 6:55am & 3:46pm the first 2 eggs have hatched. May 30/2014 around 5:25am the 3rd egg hatched. by 4:09pm the 4th egg had hatched. All chicks doing well. 1 egg to go. The 5th egg started pipping, (the process of breaking open an eggshell using an egg tooth) on June 3/2014 around 5:25 am. It was totally hatched by 11:27am. We are concerned with the late hatching of the 5th egg due to the size difference of the chick from its siblings. Our concerns lead to Siblicide (which is the killing of an infant individual by its close relatives (full or half siblings). It may occur directly between siblings or be mediated by the parents. Siblicide is advantageous for the surviving offspring because they have now eliminated most or all of their competition. It is also somewhat advantageous for the parents because the surviving offspring most likely have the strongest genes, and so, will pass these genes onto their offspring later in life, creating a strong line of genetics.) Sadness has struck our nest box. On June 5/2014 at 7:17am our 5th chick looked motionless by 5:36pm we can speculate the 5th chick has perished. On June 6/2014 there were only 4 chicks and we can definitely say the body has been consumed. Our 5 year wait to witness all the excitement of the American Kestrels life in the nest has been plagued. On June 10/2014 at 7:21am our camera is having a moisture problem and is making it difficult to monitor our family. 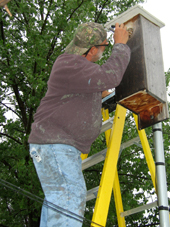 We will attempt to change the camera on June 14/2014. This will enable us to document the growing of the brood and keep our live stream going. Our stream has been down since the morning of June 10th. We initially thought it was due to camera problems. Upon closer inspection we saw the camera is fine. The young chicks have pooped on the lens! While Mom and Dad kept a close eye on me, flying overhead, I decided that camera cleaning was necessary. A messy job, but that's what it's all about. The chicks weren't bothered by the side of their house being removed. They huddled together and watched me closely but didn't make a sound. Just over 2 weeks old they're growing at a good rate. They're keeping Mom and Dad busy hunting. With Mom feeding the chicks an average of 2-3 times per hour. The chicks are maturing nicely. Their exterior feathers have colour and detail, with less of the down layer underneath poking out. We hope you're enjoying watching the live stream. If there's another camera cleaning, which we expect there will be, we'll take a few more pictures and share their progress. The 4 chicks are growing quickly and have been crawling up to the doorway of our nest box constantly getting their glimpse of a new world. Well as if are days are not full enough, the chicks keep on pooping on our nest box camera. On June 21/2014 about 8:45 am we had to clean the camera lens again. We now have this down to a science, quick and easy. Well while your up there take a few photos, and we did. On June 22/2014 about 8:10am our 4 chicks began their fledge. First the male and soon following the 3 females. Since we are a small wildlife & nature filming, production company we went into action setting up our 16ft. jib crane with camera several yards away from the nest box and hid ourselves behind a nearby shed. We manage to film the 2nd female in the fledge process. I must say after 5 years of waiting for our pair of adult Kestrels to nest in 1 of our 2 boxes this was an exciting moment for us. We captured the fledge.